Is there anything more heartwarming than your children’s smiles? Well yes actually—knowing that those smiles are healthy, too, should make parents feel good. You do a lot to make sure your children’s oral health is in top condition. Did you know that helping your children manage stress can be an important influence? Read on to learn more about how stress can impact a smile and what your family dentist in Springfield recommends. A number of different things can trigger stress in children. Some are quite similar to stressors in adult life such as world events, natural disasters, war, parental financial worries, parental divorce and of course the death of someone a child was close to. In addition to these, a preschooler may experience stress from separation anxiety. As a child matures, academic and social pressures can be very stressful. These triggers can initiate a physical response that may affect a child’s oral health. Stress can affect that precious smile in many ways. 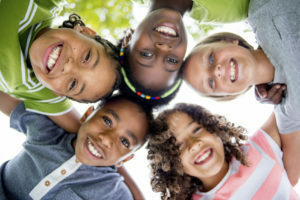 If the stress happens to be the result of family finances, then preventive and restorative dentistry may be sacrificed. In addition, a tighter budget may mean that children eat less healthy foods and more sugary choices that could lead to more cavities. Finally, stress is often physically expressed in young children who revert back to thumb sucking or teeth grinding.